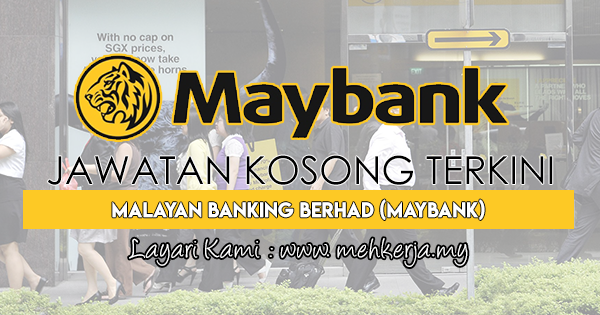 Maybank was incorporated on 31 May 1960 and commenced operations on 12 September 1960. On 17 February 1962, the bank was listed on the Kuala Lumpur Stock Exchange (now known as Bursa Malaysia). Today, it is the largest financial services group in Malaysia. Maybank is also ranked 95th in The Banker's 2015 Top 1000 World Banks (as at July 2015) and is ranked 362 in the Forbes Global 2000 Leading Companies (as at June 2016). Maybank is the largest public listed company on Bursa Malaysia, the Malaysian stock exchange, with a market capitalisation of US$19.1 billion as of 31 December 2015. 0 Response to "Jawatan Kosong Terkini di Malayan Banking Berhad (Maybank) - 25 Mac 2018"